Arm and shoulder acne is a common problem that can be very unpleasant. 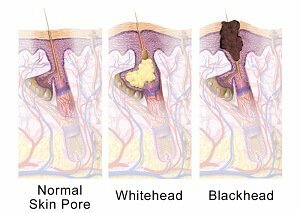 There may be a scattering of small white or blackheads, a covering of large pus filled spots or anything in between. Acne is commonly thought of only affecting the face but nearly three quarters of acne sufferers will also have problems on their shoulders, back and chest. Shoulder and arm acne can be caused by excessive production or oils that clog pores (common in puberty), friction, excess keratin or an allergic reaction. Here we will look at the common causes of shoulder acne (that may also affect the back, chest and arms) the best ways to treat them – which products work best and what lifestyle changes that can help. Acne can develop on any part of the body that has hair follicles or sebaceous (oil-secreting glands) – which is basically anywhere other than the soles of your feet and your palms. It most commonly affects the face, in fact over 90% of acne sufferers have facial acne, but 60% have back, chest of shoulder acne which usually indicates that your acne is more severe. Your back and shoulders have a number of sebaceous glands. These secrete an oily substance known as sebum. Sebum helps to protect the skin, keeping it hydrated and supple, but if the body produces too much sebum, it can clog together with dead skin cells and bacteria around hair follicles, blocking them which leads to the dreaded spots. But what causes the body to secrete excess sebum? It is not always entirely clear but is thought to be linked with hormones. During puberty, androgenic hormones such as testosterone cause the sebaceous glands to produce more sebum, which is why acne is particularly common in teenagers. Menstruation causes fluctuations in oestrogen levels which can result in acne, particularly on the back and arms. There can also be a genetic link. Another type of back and shoulder acne is what is called acne mechanica. It is caused by friction over the skin, especially in hot conditions. Acne mechanica develops when heat is trapped against the body for a prolonged period and sweat blocks the hair follicle resulting in comedone formation. 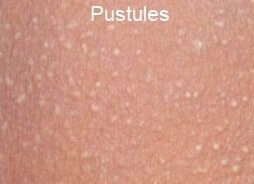 If there is also sustained pressure or repetitive friction, the pores are irritated and become inflamed, so papules and pustules develop. Shoulder and arm acne mechanica may be caused by tight-fitting clothing, backpacks, purse/handbag straps or tight fitting bras as they can all trap sweat next to the skin. Soldiers are often affected, as they carry their heavy backpacks for long periods, especially when they are in hot, humid climates. With Keratosis Pilaris, excess keratin (a protein) and dead skin cells stick together and block hair follicles causing pores to widen, forming multiple tiny bumps on the skin, most commonly on the upper arms or thigh. These bumps may be white, red or skin-coloured and can look a bit like goose bumps or plucked chicken skin. The skin tends to feel rough, like sandpaper. 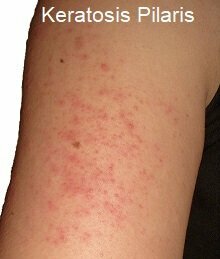 There is a strong hereditary link with keratosis pilaris and this type of shoulder and arm acne usually first presents in childhood. It often gets worse during adolescence then improves towards and during adulthood. It is often associated with dry skin conditions such as eczema. It is extremely common, affecting 1 in 3 people but is completely harmless and not contagious. Shoulder acne from keratosis pilaris tends to occur on the back of the upper arms. It usually improves during summer months and gets worse during the winter. Visit the Keratosis Pilaris Treatment section to find a whole range of treatments that can help. Allergic reactions can also cause shoulder acne. Laundry detergent, fabric softeners, body lotion and moisturisers, shampoos and conditioners can all lead to outbreaks. Acne medication cream can really help to reduce inflammation and the amount of bacteria on the skin. A good one to start with is benzoyl peroxide can really help, but beware that it can bleach clothing. Start with 2.5% strength as 5% and 10% can lead to irritation if you have sensitive skin. If over-the-counter medication is not working, you should see your doctor or dermatologist as you may benefit from stronger lotions, antibiotics or hormonal therapies. Showering in lukewarm water, particularly after exercise helps to wash off sweat, bacteria and oils and thus reduce the change of pores getting clogged up. Use oil-free body wash containing 2% salicylic acid. Avoid too much friction over the skin – opt for a soft cloth so you don’t make things worse. Make sure to completely wash off any soap, body wash, shampoo and/or conditioner so it doesn’t irritate or block your pores. Hot water opens up pores, cold water closes them. Don’t wash more than twice a day or else you can irritate the skin and dry it out which may make shoulder acne worse. Where possible, wear clean, loose-fitting, light-weight clothing, ideally made of natural fabrics like cotton to help reduce sweating. This is particularly important with T-shirts, tops and bras. Laundry detergents often contain chemicals which can irritate the skin. Try switching to a laundry detergent designed for sensitive skin, preferably one that is unscented. Change your sheets regularly, at least once or twice a week as dead skin cells quickly build up. Opt for 100% cotton sheets to reduce sweating, and don't forget to think about what laundry detergent you are washing them in. Aloe Vera, apple cider vinegar, mint, lemon juice, tea tree oil, honey and turmeric masks and green tea rinse are popular home remedies for shoulder acne. Avoid the temptation to squeeze any spots/pimples. I know it's tempting but it can cause further inflammation, it pushes the pus deeper under your skin and can cause permanent scarring. Unfortunately, there is no quick fix for shoulder acne – it usually takes a few weeks of using these treatments to notice an improvement, so don’t give up too quickly. If there is no improvement after around six weeks, visit your doctor and see what they can recommend.